The phrase of the flight attendant arouses the curiosity of passengers who most want to meet the commander. 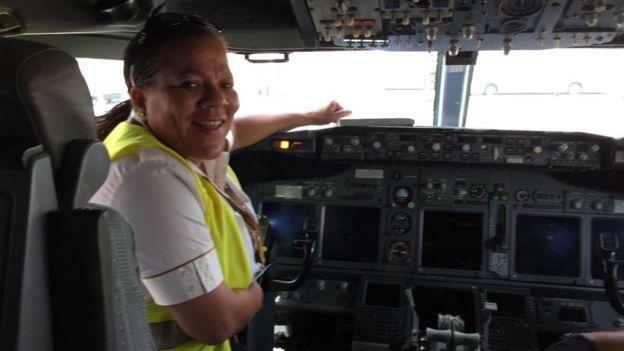 Adine Ossebi is one of the few women pilots of Central African line. The keen eye and the relaxed face, the commanding officer has a firm grip. She has just spent more than four hours flying. “I did not stop being in the air, my voice is a little broken,” apologizes the pilot. Adine Ossebi, in her forties, from Congo, is one of the few women pilots. “In West and Central Africa, there are few female pilots, while there are some in South Africa and in the Maghreb, but fortunately in my company there are two new women coming from, a Nigerian and an Ivorian,” she explains. Ossebi believes that “there are few women in this profession because mentalities have yet to evolve, and only then will women become more and more engaged in certain occupations, which are exclusively for men”. At 15, the pilot begins to feed a passion for airplanes at the sight of cockpits. She starts in an aeroclub in France. And when asked what pleasure to fly gives her, she answers with a laugh: “Freedom”. For the past four years, Adine Ossebi has been the captain of the boat. “With my male colleagues, I have no problem, and we work by following the same rules and the same standards,” says Adine Osseni. How does she reconcile family and professional life? “Seriously, this is not a problem,” says Adine Ossebi. She arranges for the care of her children when she has to move in the air with, in her hands, the lives of several hundred passengers.